Whirlpool tubs are one of the most sought-after luxury bathroom pieces in the world of interior design, and recently Hafro has released a new bathtub called the Bolla Sfioro that looks right at home in a contemporary setting. According to Trendir.com, the new whirlpool tub is fitted with a series of hydro-massage and customized settings that make it one of the most cutting-edge appliances available. Where the whirlpool really stands out is its use of sanitary features, which helps to improve the life span of the tub. It is fitted with an integrated disinfection system that filters out spent material and also uses a skimmer to remove any small particles that could be left behind. 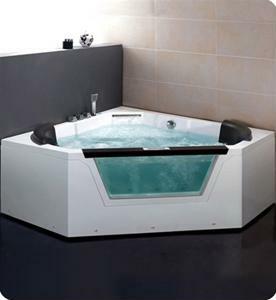 The tub also features a dazzling array of electronic bells and whistles including a temperature control and timer that will allow users to design their ideal settings. Lastly, the design of the piece is certainly groundbreaking - with a small gap between the side of the tub and the base, it gives the look of an infinity pool on a much smaller scale. Hafro's new device will set a new standard that the rest of the market will have to follow. What features do you look for in a new whirlpool tub?